A Nigerian doctor has reportedly lost his life while watching the Super Eagles of Nigeria lose to Argentina in their final group d fixture of the 2018 FIFA World Cup in Russia. 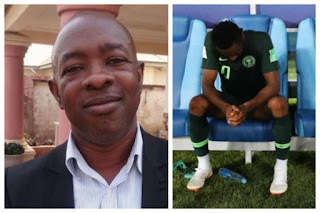 Dr. Canice Ebirim, a consultant at the Federal Teaching Hospital Abakaliki (FETHA), died during the Super Eagles and Argentina match on Tuesday. While confirming the news, the Chief Medical Director (CMD), of the hospital, Emeka Ogah, said Ebirim died within the period of the match. According to him, a friend of the deceased revealed that he started behaving funny within that period. Efforts made to revive him at our hospital proved abortive as he died but we would liaise with his family to conduct an autopsy. We are surprised at his death because he consulted at the hospital on Tuesdays. We have to wait till autopsy is conducted to draw further conclusions,” he told NAN. The Super Eagles crashed out of the 2018 FIFA World Cup after yesterday’s 1-2 loss to Argentina. The game saw Marcos Rojo score a late goal which broke the heart of many Nigerian fans.